Has a dominant Saints' team ever felt more unconvincing? Through seven games the Saints are 6-1 (very nearly 7-0) and winning their games by an average of eleven points. They might be the best team in the NFC, and are certainly (thus far) one of the best five or so teams in the NFL this season. Still, it's often felt like there's something missing this year. But that missing element is churning out, as I see it, angst in disproportionate quantities. The Saints, for the most part, are in excellent shape. Partly, it's an offense with a leaky line that's been more scattered than lethal this year. After seven weeks, this isn't an altogether new phenomenon. The 2013 Saints have steadily, consistently revealed themselves to be a team distinct from the mold of their 2009-2011 predecessors. This is a team that is less offensively dominant, but more defensively sound. In the end, they appear to be equally capable of making a run at the Super Bowl this year. It's just unfolding in a different way. Whereas in the recent past the offense has carried the team in spite of an uneven defense, this year's team is more dependent on the contributions of its defense while the offense has (modestly) leveled off after years of blistering opponents with ease. While this shift feels odd, and might be mistaken for feeling "worse" than prior iterations of great Payton teams, what we're seeing is just as effective and might even present a more sustainable model. With seven games in the books, the Saints' defense has surrendered a Payton-era best 17.1 points per game and held three of its seven opponents under 300 yards of offense this season. The Saints' offense has chipped in with a worthy 28.4 points per game (good for third-best after seven games under Payton, well behind both the '09 and '11 teams). Though the 2013 Saints' offense hasn't always artfully and effortlessly produced yards and points, they've nevertheless been pretty damn good. In four of their last five games, after a sluggish start, they've scored 30+ points. Simply, this team is no longer top-heavy on offense. They've distributed the workload to their defense, and it's produced great results through seven games. Their average +11 point differential puts them solidly aside the great '09 and '11 teams. More specifically, 2009 produced six defensive touchdowns through the team's first seven games; the 2011 team's point differential over its first seven games was skewed by a 62-7 facekicking of a freefalling, hapless Colts' team. In short, the point differential (seven games in) in '09 and '11 was weighted by a few unsustainable extremes. In 2013, the significant point differential thus far has been the result of bland, balanced efficiency on both sides of the ball. This is a good thing. Of course, the 2013 Saints are far from perfect and have plenty of areas in which to improve if they want to be more than one-and-done in the postseason. And again, it doesn't appear they've yet peaked as a team. But the foundation of a championship team is in place, even if it frequently feels like the Saints are tripping over themselves. On Sunday Drew Brees played a near-perfect game, completing 76.5% of his passes to ten players for five touchdowns. At this point, Brees's rote greatness is barely even noticeable. With a wide receiving corps that's been less-than-stellar this year, it was reassuring to see Lance Moore return yesterday. But more than that, Kenny Stills appears to be breaking out in a big way. 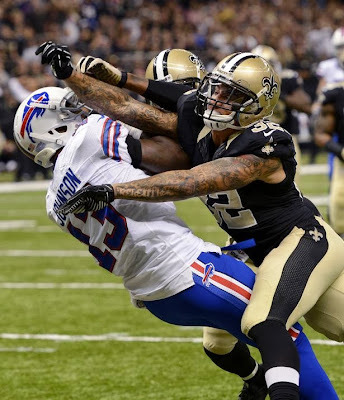 While Marques Colston has quizzically vanished from the offense (six catches for 44 yards in his last three games), Kenny Stills has emerged as a true weapon for the Saints. Though Stills might not fit the prototype definition of a "number one" wide receiver, he's far more than a one-dimensional deep threat. Prior to the season, the GSEZ blog said Stills was "already the best WR on the team." Halfway through the season, that contention may be proving itself true. On Sunday, Stills' three catches illustrated the range of his nascent talent. On one, he beat the Bills' defense down the left sideline with ease for 69 yards and a touchdown. On his second catch, Stills smuggled himself into the Bills' deep interior and found a crease for an eighteen-yard catch on a first down. Then, on the game's signature play, Stills improvised in concert with Brees for a backbreaking 42-yard touchdown. On that play, Stills smartly boxed away his defender and won the jump ball, something he did with equal aplomb two weeks prior (in double coverage) against the Patriots, a skill that belies his size, and a trait reminiscent of the viciously-good Steve Smith. The timing of Stills's emergence could not be better when you consider the tenuous health of Jimmy Graham, and a wide receiving unit struggling to make an impact. The offense, and more specifically the team as a whole--regardless of Brees's presence or Stills's emergence or the thunderous big-little duo of Graham and Sproles--will go as far as the offensive line takes them. If there's one factor (aside from injuries) that will make or break the Saints' 2013 season, it's the offensive line. Without question. Far too often this year, Brees has been sacked and hit, forced to leave the pocket or unload the ball too quickly. If that continues to happen, I'm afraid we're in for another dose of postseason misery. With upcoming games against the Jets, 49ers, Seahawks, and Panthers (twice), the Saints will face excellent, physical defensive front-sevens. How the offensive line handles those teams will significantly affect the Saints' big picture in 2013. Homefield advantage, as always, is a key component for the Saints' postseason hopes. The difference between playing two playoff games in the Dome, or going on the road to Seattle or San Francisco is significant. The defining stretch of the Saints' 2013 season will very likely unfold over the next month.